But did you know that every day is a national food or drink holiday? It’s true! There’s National Bloody Mary Day, National Cheese Lover’s Day, and even National Blueberry Pancake Day—just to name a few. I guess I'm really getting in the holiday spirit... albeit a little early for some of you! I am now in the mode of looking for gift ideas for the holidays, and I'm so happy to say that I have found a great one for the food lover in your life. It's a new calendar/cookbook titled EAT THE YEAR: 366 FUN AND FABULOUS FOOD HOLIDAYS TO CELEBRATE EVERY DAY by Steff Deschenes, and I think it's terrific! The book is set up by date so it's very easy to reference. There are fun quotations for each day as well as an explanation of the holiday and what it means to the author. In addition, there are fun trivia-like facts thrown in. Finally, there are recipes included for many of the food holidays. I'm telling you... EAT THE YEAR is so much fun! I swear that there is a food holiday for pretty much everything and anything I could ever think of! Of course, some are more appealing than others like National Lobster Day, National Grilled Cheese Day, and National Drink Beer Day. The list could go on! However, there are some pretty strange ones too like National Kitchen Klutzes of America Day, National Cabbage Day, and National Grape Popsicle Day. I can pretty much guarantee that there is a little something in this book for everyone! 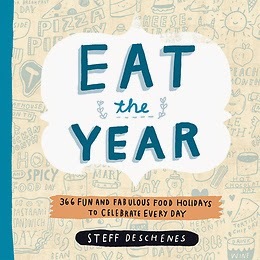 EAT THE YEAR is based on the popular blog Almanac of Eats. I probably shouldn't say this, but I wasn't familiar with this blog until recently; and it's a really fun and interesting site. You should definitely check it out. I am really enjoying all of the interesting tidbits about official (and not-so-official) state foods. I highly recommend EAT THE YEAR for foodies! Thanks to the publisher and author for providing a review copy of this book. Love this idea, sounds like it offers a lot of variety and fun.